You know it’s Manhattan because the Metro stops at Canal and Broadway. But take a right a few blocks up on Mott Street, and you’ll be in a medium-size, authentic Chinese city. This is the biggest Chinatown in the United States, and with a 160,000 plus residents, the largest concentration of Chinese outside China. Bound by Lafayette, Worth, Grand and East Broadway, the warren of colorful streets and mysterious back alleys are worlds apart from uptown Manhattan chic. 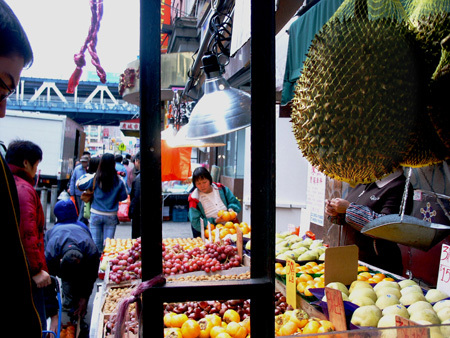 Chinatown isn’t just a stop on someone’s Big Apple itinerary. It’s its own destination with its own authentic, vibrant culture and history, where translucent fish lie in rows on beds of sparkling ice, and fresh, very pink salmon are surrounded by pyramids of shrimp, luminescent in the angled lights. Nearby vegetable stands overflow with deep purple eggplant, green leafy stalks and twisted roots, mocking the anemic produce of our sterile supermarkets. 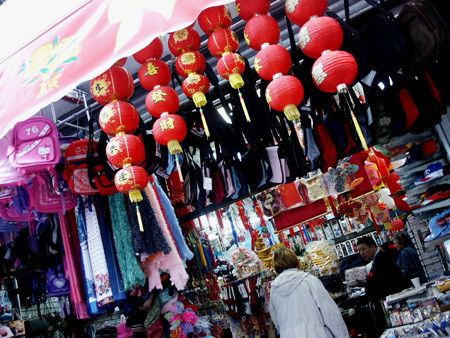 Racks of scarves, jackets and bright red paper lanterns crowd the sidewalks. Start at the Museum of Chinese in the Americas (70 Mulberry Street). This pocketsize treasure is a thoughtful, humorous introduction of Chinese culture in the Americas. Many of the objects are “found”, showing up in the detritus of the city’s early life, like an elegant Chinese opera robe, Chinese laundry tickets and old photographs. Listen to the 1960 commercials for Chung King Chop Suey (“Who will chop your suey when I’m gone”), and La Choy products, delivered in pseudo-Chinese accents. Racist, patronizing? Sure, but the absurdity is a saving grace. The sharp-eyed will appreciate the Chinatown Streetscapes. Obscured by the “stuff” for sale, a lone cobbler sits outside on stool at Mulberry and Bayard, his gnarled hands deftly repairing soles. Four old Chinese musicians sit on cardboard boxes playing ancient stringed instruments; a woman sits on the sidewalk, hunched over her work, sewing, oblivious to the flow of walkers and shoppers. You can eat your way through Chinatown. • Fried Dumplings is a two by four eatery (Mosco Street) where six dumplings, pork-filed, crescent-shaped beauties fried to a crisp, cost a few bucks. • Feast at the Golden Unicorn on squid, steamed chicken buns. The shrimp balls are the best. • Barber and beauty shops jostle the Hip Sing Business Association and a Buddhist Temple on Haircut Street (Pell Street), and Chung Chou City (39 Mott Street) sells jars jammed with herbs and ginseng and everything else. This unique patch of history and culture is what makes New York the unbeatable city that it is.